In my previous blog, I covered the list of new features that Angular 6 is offering. As Angular 6 is offering many of the interesting features, there is an imperative need to migrate an existing application(s) from the current version (4 or 5) to Angular 6. Note: Ensure Node.js V8+ is already installed as mentioned in prerequisites. Lower version of Node.js will cause issues while upgradation of cli version, however, while execution of cli you will see errors. Do not worry if upgrade throws an error. If you get an error, kindly skip this step and move on to next step. You may have to repeat this step after finishing the next step. After this run ‘Upgrade packages’ again. These two steps i.e. ‘Upgrade packages’ and ‘Solve peer dependency issues’ will be repeated until all the dependencies are resolved. After finishing all the 5 steps we are done with the upgrade of an application to Angular6! 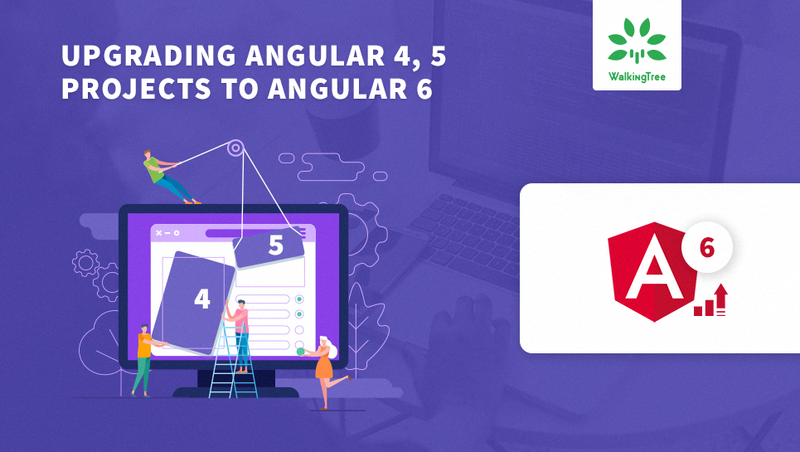 In this article, we have learned steps on how to upgrade the angular 4/5 project to Angular 6. At WalkingTree we are excited about the possibilities that Angular6 brings in for the new age applications. Hope this article will save a good amount of time for you when you come across this kind of need.